Barry Rees, a vastly experienced strongly built forward, a tower of strength in the line out and one who knew most of the answers to scrummaging problems before the questions were asked, became captain in a season resulting in 18W, 14L, 2D, 397-350. In the opening round of the Devon Cup Crediton were beaten 15-6, but Bideford put an end to further ambitions in this direction 0-21. There were good wins over Tiverton and Newquay Hornets and points shared with Launceston. In further Cornish ventures there were defeats at Falmouth and St Ives, coupled with a draw with Hayle and in a season of enhanced opposition, Barnstaple and St Lukes Extra 1st inflicted heavy defeats. At Easter, previous season’s visitors Newport Saracens were this time comfortably disposed of. The Wanderers, Angus Colville captain, had a very good season W28, L6, 701-167 whilst John Ellis, apparently enjoying a new lease of life in the Drifters, led them to final figures W22, L4, D3, 437-157 and the Floaters, Alan Weller in charge, W8, L11, D3, 288-298. The Colts, after two seasons of trying to raise full sides with regularity, slowly flourished again in number, to end W12, L15, D2, 351-446. Frank Lavis returned to the helm as captain, Barry Rees retired from the playing arena, to take over as coach. Terry Williams led the Wanderers and John Ellis and Tony Weller in charge of the Drifters and Floaters respectfully. The Devon Cup did not interest the Club for long this season, Kingsbridge being its downfall, at Kingsbridge, by a margin of 7-10; trailing 0-10 at half time. This defeat, however, gave the Club automatic entry to the Havill Plate which was for clubs knocked out in the first round of the Devon Cup. In this competition Salcombe were convincingly disposed of at Salcombe 38-15 Peter Marshall at full back contributing 14 points; in the next round at Cullompton further success 17-3; on to the semi final against Paignton at Paignton success again 16-9 bringing the club to the final against Ilfracombe where they failed by a margin of 6-12 Guy Pessell kicking two penalties to a goal, a drop goal and a penalty. It is perhaps worthy of note that in all their Plate games, the Club was drawn away and received no monetary reward whatsoever for their travels. The season’s results were, once again, a matter for satisfaction W29, L8, 739-319, including the double over Okehampton, South Molton, Services A and Old Heleans, a very tight 7-6 victory over Exeter A and 2 wins and a defeat against Brixham 1st XV and a touch and go 19-21 v Truro 1st XV. The Wanderers, restored to the bosom of the Plymouth and District Rugby Combination, reached the final of the Lockie Cup 16-6 v OPOs and 16-10 v Launceston A, to crash in the final against Plymouth Albion United in late April 0-27. In most of their matches, they indulged in some heavy scoring on their own account, as witness their final figures W26, L6, D2, 791-252. The Drifters, with John Ellis still enjoying his Indian summer, ran in 538-265 winning 19, losing 10, whilst the Floaters enjoyed an upsurge W17, L10, 521-305. The Colts, a shade disappointing, but still achieving a points surplus W12, L14, D3, 374-291. In the meantime, Tom Hitchins had proclaimed there should be an extension to the changing accommodation and under his inspiration and drive, work proceeded steadily. Dave Sharp, a fast moving quick thinking stand off from the teaching profession - as several Argaum stand off’s had been - was captain. John Price in charge of the Wanderers, John Ellis in charge of the Drifters at the same time doubling as fixture secretary. A season of mixed fortunes for the senior side largely of their own making by their insistence on running and passing irrespective of weather conditions or if in their own 25 or their opponents, the result exciting but frustrating, as witness Tiverton 10-34. The full season’s figures W20, L16, D2, 660-446. In the Devon Cup they romped home in the first round at Honiton by a margin of 57-3, in the next round at home they avenged the previous years Havill Plate final, by defeating Ilfracombe 18-10 (tries by Gray 2, Critten, Baskerville plus a Marshall conversion) to be drawn away in the next round to Devonport Services where, at the Rectory, the navy side once again put paid to further progress by a Glyn Jones try - the only score - 11 minutes from the end. In other results, a surprisingly decisive win over Truro 39-9 and a rare double over Exeter Saracens - regarded as a bogey team. On the other side of the coin, Tiverton won the return comfortably and Falmouth and Launceston also gained the double, although the latter won the return by the narrowest of margins 3-4, whilst Welsh touring side Ammanford gained a comfortable win at Bickleigh over Easter. Once again the Wanderers results showed the benefit of having an experienced player as captain, John Price stamped his own brand of rugby on the side who responded with figures of W29, L4, 927-263, the one surprise, defeat and deservedly so by DHSOB in the Lockie Cup, with a score line of 9-19. The Drifters broke even W13, L13, D1, 473-299, whilst the Floaters who did not fulfil fixtures from March onwards W9, L8, 246-227, and the Colts W15, L14, D1, 559-263. The year saw the announcement of the death of E H (Birdie) Partridge, President for many years after the first world war who almost to his death kept himself informed of the Club's progress. The additional changing accommodation was formally opened. Former player Peter Blackburn - an extremely successful entrepreneur - had been invited to perform the opening ceremony but unfortunately, his plane to Plymouth was grounded by weather conditions. In the circumstances his mother Maud Blackburn - widow of the former president Tom Blackburn - stepped graciously into the breach and performed the opening ceremony, thereafter, receiving quite unpurturbed - the beer tankard intended for Peter. Records do not reveal the quantity of liquid contained in the tankard! Peter Green, a long serving prop forward was captain, Norman Joyce in charge of the Wanderers and Chris Gray the Drifters. The 1st XV W17, L13, D3, 460-409. 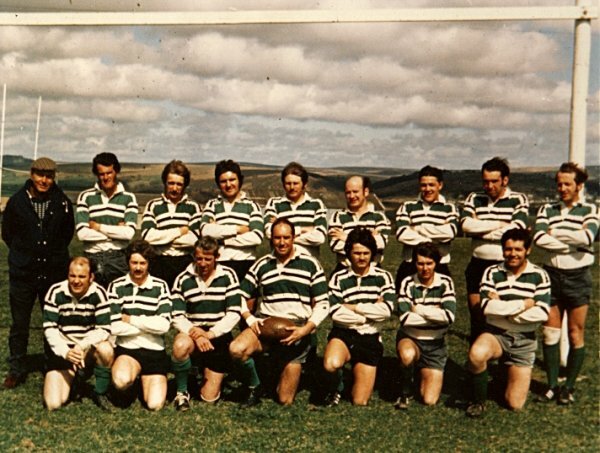 It was noticeable that some of the stronger opposition and particularly Newquay Hornets - encouraged doubtless by the support of their County Union in their senior status - inflicted heavy defeats, whilst 1974 produced but two wins and a draw in thirteen games. The Wanderers managed 16 wins, a draw and 18 defeats, 557-498. The Drifters had little success W7, D1, L15, 163-489. In the Devon Cup the club disposed of Paignton at Paignton 17-11, but went out at Barnstaple in the next round 9-25. The Floaters barely operated, playing but one game and the Colts W12, D1, L10, 300-296. Fred Rogers, who had been with the Club since his school days became captain. The season opened with two difficult fixtures against Plymouth Albion Extra 1st and Truro and a young Argaum side was comprehensively beaten in both encounters. The side recovered from this disappointing start to wind up with 19 wins, 18 losses and 2 draws. New ground was explored in fixtures against Yeovil and indeed, a new approach in that the side travelled to Yeovil the night before. They must have found the local hostelries to their liking, as they crossed over 13-0 in the lead with tries by Fred Rogers and Ceri Critten. The report reads "Critten weaved through his opponents almost the length of the field". In the Devon Cup, Withycombe were beaten 10-6 in the first round and there are no prizes for guessing who put an end to the Club's further progress, you’ve guessed it - Devonport Services 7-13. Both the Wanderers and Drifters had poorish seasons and the Floaters disappeared from the map. The Colts had "middling" results W8, D2, L11, but included a 6-4 win over the Royal Navy Colts. During the season, the Club came close to purchasing its own ground - an ambition yet to be achieved - in that a price was agreed and a mortgage from the RFU arranged but before the signing of contracts the Vendors suffered a change of heart. Geoff Baskerville, back row forward, who had been kicking goals for Argaum for some seasons - (and indeed continues to do so, albeit now for the Wanders), became captain, he was a member of a long standing and successful back row of Rogers, Lavis and Baskerville. The season opened with a good 6-0 win at Truro the team G Gray, B Willcocks, R Dougall, A Blonden, S Leeson, C Muir, C Critten, C Gray, L Marshall, S Body, J Morgan, S Eslick, F Rogers, G Baskerville, C Lewis, followed a pointless draw with Okehampton and wins over Plymouth Combination 12-4, despite losing Ceri Critten in the first half, and Okehampton in the return - 18-4. South Molton were disposed of in the first round of the Devon Cup and by mid December the club was unbeaten in its last ten games. However, on December 13th they came up against a much improved - and improving - Launceston side, to crash 6-33, after keeping the half time score to 6-11. Crediton - for a change - snuffed out further cup interest to the tune of 0-12, largely due to their ability to kick goals, other results 12-22 against a strong Brixham side and 6-19 (0-0) half time against that other rising Cornish side, Newquay Hornets. Nevertheless the 1st XV record was an encouraging W22, L9, D2, 472-340, but the record of the other sides makes dismal reading. Steve Body was captain, with Fred Rogers as Secretary. There was an early defeat 4-18 at the hands of Plymouth Albion Extras, the Argaum forwards battling well, but generally the Club failed to make the most of its chances. 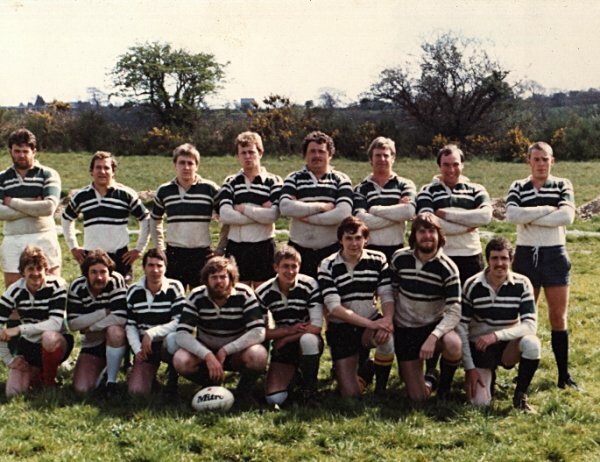 In the Devon Cup Old Technicians knocked out the Club in the first round at Bickleigh Down 11-11, the visitors going through as the away side, the Old Technicians equalising try coming in the closing moments, Argaum scorers, tries Baskerville and Willcocks plus a Geoff Geary penalty. A 62-0 win over Old Heleans indicated the old boys were but shadows of their former selves, of 14 tries scored but 3 were converted - possibly as well in view of the score. Predictable defeats by St Austell and Newquay Hornets and then Tavistock administered the "chop" in the Havill Plate, a Tavistock try to Argaum’s penalty. Draws with Kingsbridge 9-9 - coming back from a 0-9 deficit and a high scoring draw with Totnes 20-20, tries Borrowdale (2) and Gamblen plus 2 penalties and a Baskerville conversion. Launceston were given a shock at Bickleigh Down just before Christmas 3-4 and St Austell were beaten in the return 12-6 whilst Newquay Hornets were (almost) held 6-8, but just when results were less depressing, disaster at Launceston ended the season 10-16. Argaum scores; tries Lavis and Willcocks, Eastley a conversion. The 1st XV record W8, D6, L17, 345-444, and whilst the Wanderers won more than 8 games, their points record was a deplorable 180-501. In the meantime, the Drifters had ceased to operate which threw a great strain on the Wanderers. The season’s press review suggested the Club’s lack of success was due - in part at any rate - to the pressure put on some of the senior players in having to undertake so many administrative duties. Indeed, it was a fact that the three musketeers of the back row, Fred Rogers, Geoff Baskerville and Frank Lavis, held more official posts between them than even Pooh Bah of the Mikado!! Geoff Baskerville back in command, the record improving to the extent of 14 wins, a draw and 17 defeats, 328-424, the Colts W11, L15, 328-277, and the Wanderers, who had difficulty in raising a full side at times, W7, D1, L12, 206-486. Injuries in the early part of the season had some affect on the record, after Christmas when these problems had pretty well resolved themselves the, 1st XV lost but 3 games in the latter part of the season. There was a modest run in the Devon Cup 19-6 v South Molton and 9-6 v Plymouth Civil Service, until almost inevitably Devonport Services, only this time 0-34 after a half time score of 0-3. Against the Cornish quartet of Truro, Newquay Hornets, St Austell and Launceston the 1st XV went down once again, although not by catastrophic margins. There was an encouraging 16-9 win over Plymouth Albion Extras (tries Lavis, Rothey and Baskerville plus 2 conversions from his boot), unfortunately the following week the result was reversed 6-24, largely due to the boot of one Paul Zynda’s 18 points, who in the past had worn the Argaum shirt. Easter tourists Blaina (S Wales) proved 48-0 victims, but Cwmgrach, also from the Principality, were sterner opposition, tries from Mike Borrowdale and Peter Campion to nil providing the difference. Alex Martin of the Colts played for Devon Colts and also scored for the 1st XV in a narrow win over Tavistock. Early in the season injuries side lined Fred Rogers, Ceri Critten, Huywell Phillips, Chris Gray, Kim Jarvis and Steve Leeson for several weeks, Peter Green always prepared to put on the shirt for any team that required his services, although he was barred by the Colts - made himself responsible, doubtless in his spare time, if any, for preparing and serving no less than 680 meals to visiting sides. Hywell Phillips - several seasons in the 1st XV pack, was captain, Kim Jarvis leading the Wanderers. The arrival at the Club of John Hunt, a scrum half with Albion experience, solved a position that had long created problems, whilst the old firm in the back row of Rogers, Baskerville and Lavis still operated on most occasions. South Molton were narrowly beaten 6-3 in the opening round of the Devon cup, the Argaum team: Borrowdale, Willcocks, Sharpe, Gamblen, Skerton, Worth, Hunt, Mannell B, Phillips, Crowther, Walker, Rogers, Pascoe and Lavis. Unfortunately, Hywell Phillips was injured in this match which side-lined him for some weeks, Peter Gamblen taking over the captaincy. Dartmouth were comfortably disposed of 30-4 in the next round tries by Dave Sharpe, Terry Pascoe, Fred Rogers (2) and Kevin Skerton, with 2 Geoff Baskerville penalties and 2 conversions by full back Geoff Geary. St Austell inflicted a crushing 0-53 defeat in October, reversed early in December at Bickleigh Down, 16-7, the press remarking that since their defeat by Argaum, St Austell had lost their last four games - thereafter increased to five! The next round saw the defeat of the College of St Mark and St John; scorers Brian Willcocks, Fred Rogers and John Hunt, plus a Geoff Baskerville penalty and a conversion. The report speaks of "the steadying influence of a very experienced back row". This left the field open for Exeter University in the next round, but unhappily, there is neither a report nor result available, but as there is no further mention of cup rugby for the Club, the conclusion is inevitable! Defeats at the hands of OPMs, Truro, Launceston (twice), Exmouth (twice) and Newquay Hornets (twice), however, Plymouth Albion Extras were contained 12-10 due largely to John Hunt’s brilliant line kicking, coupled by a Kim Jarvis try, plus 8 points from Geoff Baskerville’s boot to a try and two penalties. The season ended on a saddish note, Newquay Hornets and Launceston between them scoring 85 points. The colts, under the tutelage of former captain Tony Blonden, excelled themselves, by reaching the final of the Devon Colts Cup, disposing of Plymouth Albion Juniors en route, to face a very experienced Barnstaple Colts side, in their first ever final. In the event, they went down 0-10. "Before probably the largest crowd ever seen at Bickleigh Down, the Plymouth side was subjected to tremendous pressure most of the game, but defended valiantly, particularly through the captain Jerry Woolerton and flanker Mark Hopper. The final quarter saw the home backs come into the game, when at last the pack was able to provide them with some possession, but they were unable to break through. Ceri Critten, a long serving, fast moving wing three quarter, even prepared to step into the Scrum Half’s shoes if required, was elected Captain, but unhappily suffered a serious injury midway through the first half of the season, which kept him out of action until the following season, so that Dave Sharp took over. The first match saw the Club put up a spirited performance, before going down 9-14 and after a narrow defeat (13-15) by Devonport Services A, moved onto a run of 5 wins and a draw - this 6-6 home to Newquay Hornets - with 122pts to 22. One of these games, at Salcombe, "where on their first visit for many years encountered some spirited opposition … from a section of the crowd …". This did not seem to perturb the Argaum side, who won by 31-0, of which winger Nick Hall (which started him on a purple patch) contributed 11 points. He next scored 16 of the 26 against South Molton and 17 out of the 33 against the College of St Mark and St John. Thereafter followed a mixed bag of results, including a 4-0 defeat in the Devon Cup at the hands of Ivybridge, the latter intelligently playing 10-man rugby in windy conditions, whilst Salcombe very comfortably disposed of any Havill Plate ambitions. Touring sides Kidderminster and Old Brockleians both won their closely contested games and the Club ended the season W16, L18, D1, 439-474, somewhat disappointing after a bright start. The Wanderers W14, D1, L15. Of the Colts side, Roger Bailey played for Devon Colts and Devon U21 and in conjunction with Andy Davey, appeared for the 1st XV.